The SS20 is a datacom interface device for SCADA & industrial control applications where two independent host or master devices need access to a slave device or network of slave devices, and/or to provide communications failure detection of serial networks. The SCADASwitch SS20 has two RS-232 input ports and one output port that has both RS-232 and RS-485 interfaces. The SS20 also has a USB connection for configuration, Local operator interface to connected devices, and built-in protocol analyzer. With low power draw, small size, DIN rail mounting, and Class I Div 2 rating it is ideal for use in remote EFM/RTU applications. Allows 2 SCADA hosts to simultaneously poll the same network of RTU / EFM devices. The SS20 can perform multiplexing on any request-response protocol including Modbus RTU, ASCII, ROC Protocol, and BSAP Protocol. Translates Modbus address on Input Port to a different address on Output Port. This feature is useful when the same RTU exists on 2 different SCADA networks and needs to be addressed with a different Modbus address on each network. Prevent Modbus Writes to PLC/RTU/EFM on a specific Input Port. This feature can be used to grant Read-Only access to a third-party SCADA host. Monitor communications traffic through the SS20 and indicate com failure via relay output. This feature can be configured to watch for specific types of messages or specific addresses and has configurable timeout settings and relay output states. 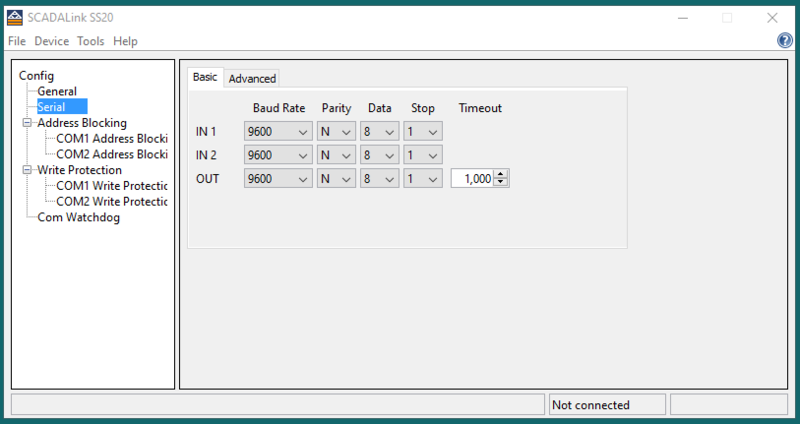 Allows an RTU with no handshaking signals to key a radio modem that requires keying. 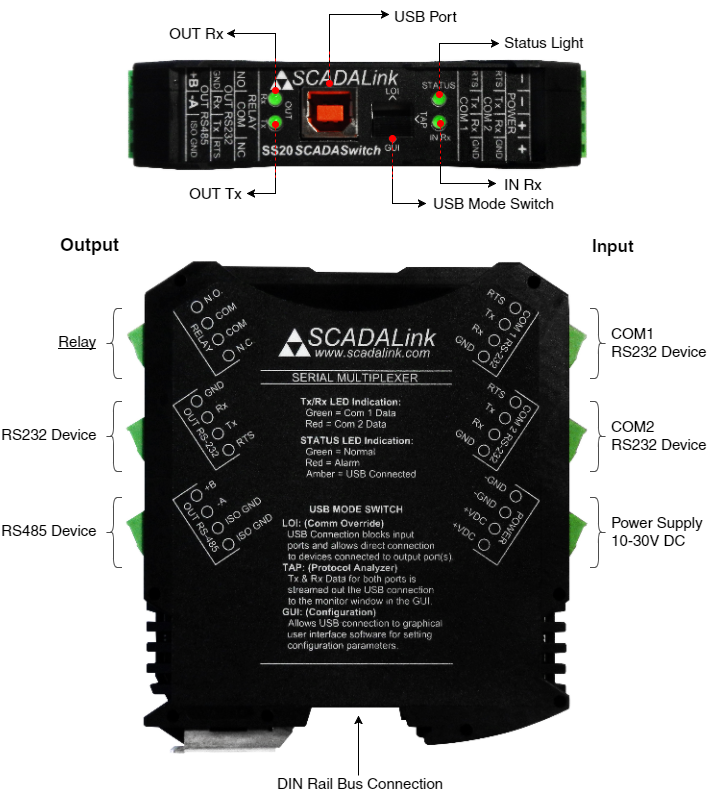 Allows flexibility in SCADA Installations where both RS-485 and RS-232 devices need to be interfaced without adding extra converters or serial splitters. Isolated RS-485 Outputs prevent ground loops. The SS20 has a Form-C Relay that can be used for communications monitoring. The relay can be configured to switch on time-out of SCADA communications. This can be used as an input to a PLC or RTU input to indicate SCADA communication failure. When the USB Port is connected and the USB mode switch is set to LOI (Local Operator Interface), the USB port overrides the RS232 inputs and routes USB traffic directly to the RS232/RS485 outputs. This mode is used for programming and maintenance access of downstream devices. When the USB Port is connected and the USB mode switch is set to TAP, the USB port can be used to monitor the output port traffic. This mode can be used for data communications troubleshooting. The SCADALink SS20 is configured using the SS20 GUI Software connected via the USB port. 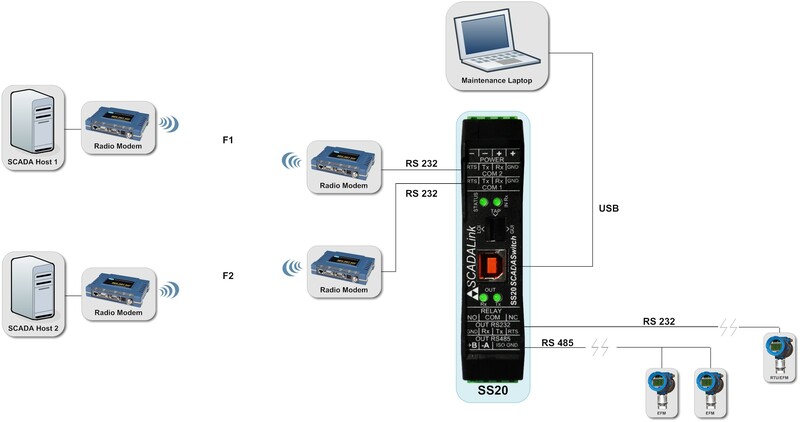 The SS20 enables 2 SCADA Masters to simultaneous communicate to a single PLC, RTU, or EFM. 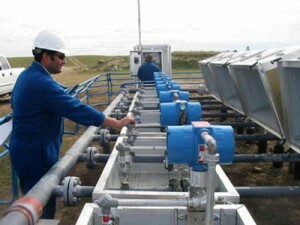 This is a common need in Oil and Gas Industries. One SCADA Host could the local field host; the other host could be a Cloud Host. 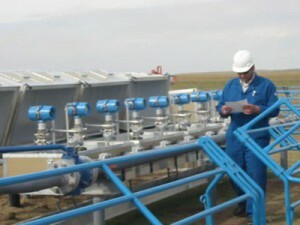 Sometimes the two SCADA host could belong to separate companies; the well operator, and the well owner; the pipeline company and the well owner. Use the SS20 to connect devices with RS485 connectivity to the SCADA host or Master RTU. The SS20 has a USB port with override function which allows programming and maintenance access of device without connection of radio-modem or master RTU. The SS20 with Isolated RS485 connectivity prevents grounding issues and protects plant equipment from lightning surges. The SS20 allows multiple masters to access devices multi-dropped in an RS485 network. 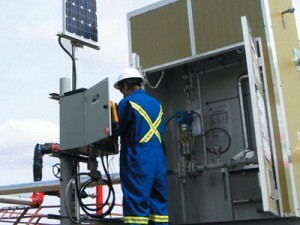 The 2nd host or LOI port may be used for maintenance software access used to configure, or diagnostic of smart instrumentation, flow computers, or analyzers.